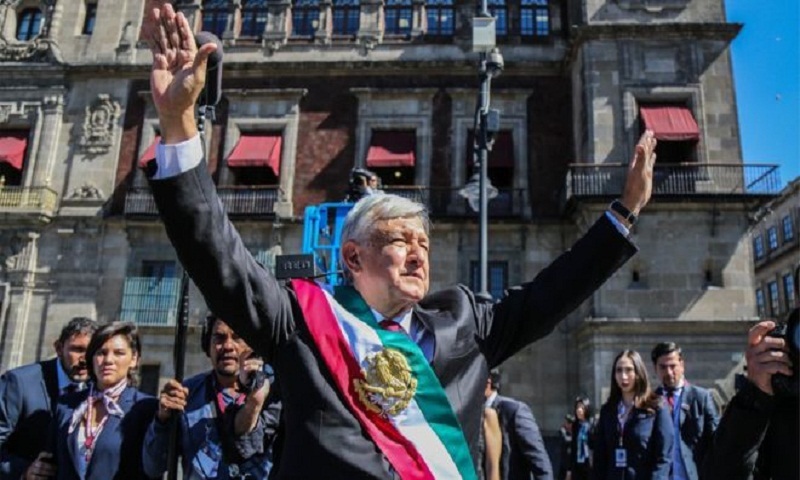 Andrés Manuel López Obrador - Mexico's first leftist president in seven decades - has been sworn in at a ceremony in the country's parliament. The former Mexico City mayor pledged on Saturday to end corruption and impunity to transform the nation on behalf of the poor and marginalised. The 65-year-old, popularly known by his initials Amlo, won a landslide victory in July - his third presidential bid. The political veteran begins his six-year term with approval ratings of 56%. His predecessor Enrique Peña Nieto leaves office with only 24% - his administration was plagued with corruption scandals and murder rates reaching record-high levels. President López Obrador inherits an immediate foreign policy issue - what to do about the thousands of Central American migrants camping on the US-Mexico border. Foreign dignitaries including US Vice-President Mike Pence, first daughter Ivanka Trump and Venezuelan President Nicolás Maduro attended the inauguration in the capital. British Labour leader Jeremy Corbyn, who Mr López Obrador considers a close friend, was also present. Mr López Obrador - whose leftist National Regeneration Movement party (Morena) will lead a coalition government - later took part in a traditional indigenous ceremony in Mexico City's Zocalo square. "We will carry out a peaceful and orderly but also deep and radical transformation," the silver-haired leader said in his first speech to Congress. "Because we will put an end to the corruption and impunity that are blocking Mexico's rebirth." Mr López Obrador reiterated many of the populist pledges he made during his campaign, tackling crime, poverty and corruption. He intends to rule frugally - selling Mexico's presidential plane, not living in the presidential palace, and by cutting his own salary by 60%. Mexico has privatised almost every part of its economy over the past three decades and Amlo vowed to reverse what he called disastrous neo-liberal economic policies of his predecessors. He promised that he would "never seek re-election" and more surprisingly, announced his intention to promote a recall referendum during his administration, allowing voters to remove an elected official through a direct vote. "I no longer belong to myself, I belong to you, I belong to the people of Mexico," the new president said. President López Obrador has signed an agreement with three Central American counterparts to create a plan to stem the flow of migrants seeking asylum in the US, the Associated Press reported. Mexico's foreign ministry said the plan included a fund to generate jobs in the region. In the Mexican border city of Tijuana, more than 6,000 migrants from Honduras, Guatemala and El Salvador face months of waiting for their asylum claims to be processed. They say they are fleeing persecution, poverty and violence in their home countries and have travelled more than 4,000km (2,500 miles) for a chance at the American Dream.